Around 1906, Francis Little, a lawyer and owner of a utilities company, was advised to move north from his home in Peoria, Illinois, for health reasons. Upon arriving in Minnesota, he moved into a house in the Kenwood area of Minneapolis with his wife, Mary, and their daughter, Eleanor. In 1907, he purchased land in Deephaven, Minnesota, about ten miles west of Minneapolis, overlooking scenic Lake Minnetonka. 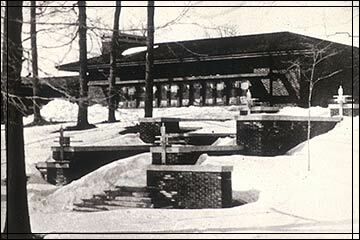 And around 1908, the Littles commissioned Frank Lloyd Wright, who had designed their home in Peoria, to design a summer residence for them on the lake site; initial plans were drawn that same year. Because Wright left for Europe in 1909, returned in 1911 and then spent part of 1913 in Japan, the house was not completed until 1914. Although several letters from Mr. Little to Wright indicate his frustration with the delay, the Littles had a close relationship with Wright and were willing to wait for him rather than choose another architect. During this time, the Littles spent their summers on the lake property in a cottage that Mr. Little designed in the style of Wright's work. Wright designed one of his last great Prairie School-style residences for the Littles. It consisted of two offset rectangles joined at the corner, which formed a single 250-foot axis parallel to the lakeshore. The characteristic long, low, hipped-roofed building hugged two gentle hills overlooking the lake. Windows spanned the entire lakeside elevation, giving the Littles full advantage of the scenic view; Wright, who drew elaborate designs for the windows, and Mr. Little, who did not want an intricate design that would obscure his view, discussed this feature at length. The most spacious and elegant room of the house was the large living/music room designed especially for Mrs. Little, an accomplished pianist who had studied under the composer Franz Liszt in Cologne and who planned to host recitals at the house. The sprawling brick-walled and wood-trim dwelling also included an appropriately grand entrance stair of thirty-six steps in three levels.